West Lilburn Tower. Photo by Peter Ryder 1994. The parish of Lilburn lies in north Northumberland on the edge of the Cheviots. It has a rich variety of archaeological and historic sites, including cropmarks, prehistoric burial places, medieval and later buildings. The first people to have left traces behind them lived in the Mesolithic period. Some of their flint tools have been found and would have been used by people who travelled to seasonal hunting grounds in the search for food. Later, in the Neolithic period, people began to lead a less nomadic way of life and started clearing trees away to make fields. Stone axes, like that from East Lilburn, were used to chop down trees in preparation for farming. Neolithic people also left some mysterious symbols carved in the rock at Fowberry Enclosure. Called cup and ring marked stones, these rock carvings occur mainly on the Fell Sandstones in Northumberland between Rothbury and Ford. Bronze Age people have left much more evidence behind including ritual and burial monuments. Many Bronze Age burials have been found in Lilburn, and nearly all were found by ploughing in the 19th century. Most lay in cists or urns, for example at Lilburn South Steads, Lilburn Hill Farm and Lilburn Tower Farm, but at Clover Bank field a series of shallow pits containing cremated bone were each covered by three small stones and over them all was a large cover stone decorated with cup and ring marks. Most of the graves contained objects, such as pottery, charcoal, flints, a jet button and a bronze knife. More evidence of the ritual side of Bronze Age life comes from a standing stone near Newtown Mill. Until the Iron Age there has been virtually no evidence of the places in which prehistoric people lived. They lived in enclosures surrounded by ramparts or banks; sometimes these were defensive and placed in prominent hill top locations, but many occur in lowland areas. These were small farmsteads where an extended family group may have lived and worked and some may have continued largely unchanged into the Roman period. In the Iron Age enclosures are usually circular in shape such as Castle Hill camp and Trickley Hill camp. In the Roman period the farmsteads become squarer such as at Red Scar Wood. It survives as a cropmark and is one of a number of such sites in the parish that, although undated, show enclosures, a pit alignment and possible field system from prehistoric or Roman times. Lilburn lies well north of Hadrian's Wall and there are no Roman military sites here, although the Devil's Causeway Roman road runs along the east side of the parish. In medieval times people lived in small villages and hamlets at Trickley and Newtown, East Lilburn and West Lilburn. Over the years these settlements have shrunk in size or become deserted, but at West Lilburn the old village was probably cleared away when the grounds of Lilburn Tower were created in the 19th century. However, not everything was swept away as the remains of a 12th century chapel and burial ground have survived at West Lilburn as well as a 15th century tower house. 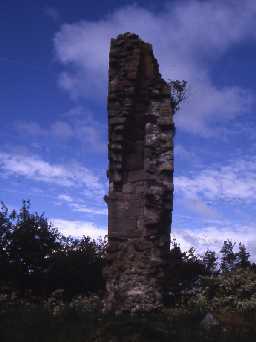 Another medieval structure is the Hurl Stone, a standing cross, although it may not be in its original position. The tower house serves to remind us that the border region of England was a dangerous place to live as the medieval period was a time of warfare between England and Scotland. Those who could afford it built defensive houses to protect themselves and originally there are said to have been two towers at West Lilburn. By the 18th and 19th centuries more peaceful times had arrived in Lilburn and people began to invest more in their surroundings. A new Lilburn Tower was built, not a defensive building like the medieval tower but a comfortable country house with a landscape park, stables, observatory and lodge. Farming also began to develop more productive and innovative methods and a series of fine farmhouses and planned farms were built, including East Lilburn and Newtown, and a corn mill was built at Newtown. Communications were also improving with the building of turnpike roads such as A697 Coldstream road. Lilburn West Bridge is an early 20th century concrete bridge spanning the Lilburn Burn.